The explanation of this photo, which was the Wikimedia Commons Picture of the Year in 2010: "In mid-August 2010 ESO Photo Ambassador Yuri Beletsky snapped this photo at ESO’s Paranal Observatory, Chile. A group of astronomers were observing the centre of the Milky Way using the laser guide star facility at Yepun, one of the four Unit Telescopes of the Very Large Telescope (VLT). Yepun’s laser beam crosses the southern sky and creates an artificial star at an altitude of 90 km high in the Earth's mesosphere. 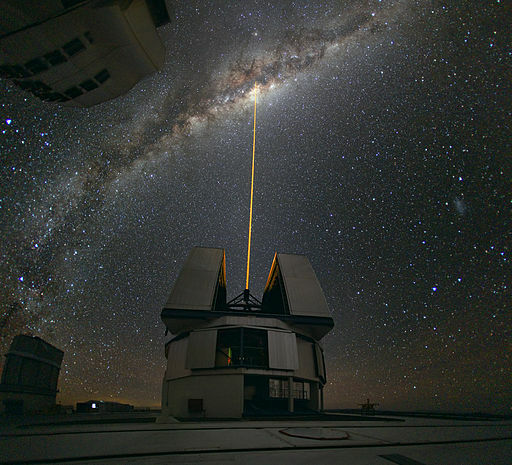 The Laser Guide Star (LGS) is part of the VLT’s adaptive optics system and is used as a reference to correct the blurring effect of the atmosphere on images. The colour of the laser is precisely tuned to energise a layer of sodium atoms found in one of the upper layers of the atmosphere — one can recognise the familiar colour of sodium street lamps in the colour of the laser. This layer of sodium atoms is thought to be a leftover from meteorites entering the Earth’s atmosphere. When excited by the light from the laser, the atoms start glowing, forming a small bright spot that can be used as an artificial reference star for the adaptive optics. Using this technique, astronomers can obtain sharper observations. For example, when looking towards the centre of our Milky Way, researchers can better monitor the galactic core, where a central supermassive black hole, surrounded by closely orbiting stars, is swallowing gas and dust."